Here are some of the best and cheap events happening in the Greater Boston Area this weekend! 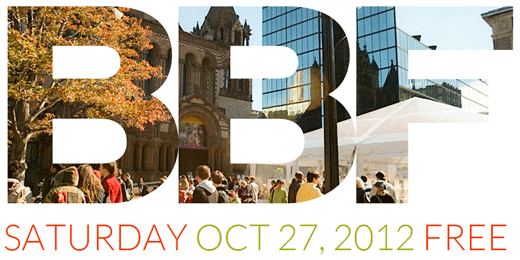 Boston Book Festival: Saturday, October 27, 2012 from 10am-7pm in Copley Square. Join authors, storytellers, costume characters and more in this one-day book festival. For the schedule of events or more information, please visit here. Boston Vegetarian Food Festival: Saturday, October 27, 2012 from 11-6pm and Sunday, October 28th from 10-4pm at the Reggie Lewis Athletic Center. Stop by this veggie fest to learn more about vegetarian products, taste some free samples, and more! For more information, please visit here. Monster Mash for ALS: Saturday, October 27, 2012 from 11am-1pm in Woburn, MA. Come join this Halloween-themed Flash Mob to help raise money and awareness for amyotrophic lateral sclerosis (ALS). Free, but you must wear a costume. For more information, please visit here. Free Admission at the ICA: Saturday, October 27, 2012. The last Saturday of every month (except December) the ICA offers free admission for families (up to 2 adults and children). For more information, please visit Saturdays program information here. The Great New England BBQFest: Saturday & Sunday, October 27-28th, 2012 from 10am-5pm at Wachusett Mountain in Princeton, MA. Come enjoy some delicious BBQ, live music, tractor pulling competition, farmers’ market, craft fair, and much more! $10 for adult tickets at door, but family deals are available too. ($8 for advanced adults tickets, but must be purchased a day in advance!) For more information, please click here.